What Time Is It?! Full-Season DVD Release Time! HECK YEAH!!! At long last, the wait is over as Cartoon Network has announced the DVD release of the entire first season of its Emmy(R)-nominated animated comedy series Adventure Time! Yep, that's all 26 episodes from the show's first season, plus heaps of bonus features created by Pendleton Ward and the show team, including featurettes, episode commentaries, animatics and more packed into a sweet DVD package. The Adventure Time: Complete First Season two-disc set will be available on July 10, 2012 for the suggested retail price of $26.95, making it a must-have for the series' ravenous fans, who can relive all of the original adventures of best buddies Finn and Jake in the magical land of Ooo. 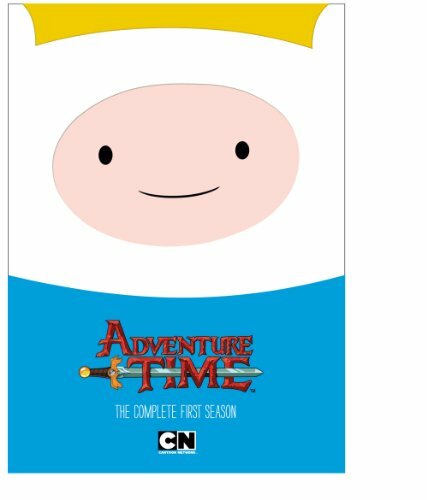 Since our first DVD release last September, fans have been telling us nonstop that they want to own full season sets of Adventure Time on DVD. Because the show is for everyone, both kids and adults, we're really happy we can put this out, said Erik Resnick, vice president of Cartoon Network Enterprises, the home entertainment division of Cartoon Network. In addition to the great episodes, Pendleton and the show team have created some great bonus features on this set that we're sure fans will love. The highly-anticipated bonus materials in the Adventure Time: Complete First Season DVD release include: behind the scene featurettes of the crew, the composers and more filmed by creator Pendleton Ward with his very own camera phone; animatics featuring commentary by Ward, Adam Muto, Pat McHale and Derek Drymon for the Rainy Day Daydream, Slumber Party Panic, Dungeon and The Enchiridion! episodes; and episode commentary from cast members and special guests including: Prisoners of Love with John DiMaggio, Jeremy Shada, Tom Kenny and Ward; Ricardio the Heart Guy with George Takei, Hynden Walch, Kenny, Shada and Ward; Tree Trunks with Bettie Ward and Polly Lou Livingston; and Trouble in Lumpy Space with DiMaggio, Shada, Kenny and Ward. Joining the Adventure Time: Complete First Season DVD release at retail are the compilation releases, Adventure Time My Two Favorite People and Adventure Time It Came from the Nightosphere, which are both currently available at retail and offer fans a lower-price point option to add to their DVD libraries. The popularity of Adventure Time continues to surge as both the show's ratings and the brand's consumer products program continue to grow. Throughout its first three seasons, the Adventure Time series has garnered great ratings success with more than 44.3 million kids 6-11 and 35.8 million boys 6-14 tuning in to the series, and making it the #1 show in its timeslot for boys 6-14, according to Nielsen Media Research[i]. In addition, Adventure Time's presence at top retailers across the country is continually expanding though the property's comprehensive line of hard and soft consumer products which includes toys, apparel, accessories, youth electronics, comic books, posters and much more. Cartoon Network will support the release of Adventure Time: Complete First Season with targeted on-air advertising spots on Cartoon Network, as well as a kid-focused online marketing campaign on Cartoonnetwork.com and other kid and parent targeted websites. Created by Pendleton Ward, Adventure Time is produced by Cartoon Network Studios in association with Frederator Studios, Adventure Time leads viewers on the fantastical adventures of unlikely heroes, Finn & Jake, buddies who traverse the mystical Land of Ooo and encounter its colorful inhabitants. The fourth season of Adventure Time will premiere on Monday, April 2 at 7:30 p.m. (ET/PT) on Cartoon Network. Artwork is available by request. [ii] Source: IGN.com's DVD review from September 22, 2011 of "Adventure Time: My Two Favorite People." [iii] Source: LA Weekly's column from July 25 titled Adventure Time is a Hit at San Diego Comic-Con. [iv] Source: USA Today.com's Pop Candy column from July 26, 2011 titled "50 Things I Learned at Comic-Con." [v] Source: EW.com's Popwatch column from May 25, 2011 titled "The 25 Greatest Animated Series Ever."